It’s dead on arrival (DA) for the proposed new Department Order (DO) on endo of the Department of Labor and Employment (DOLE) as far as labor groups are concerned. The draft DO, the country’s major labor groups under the labor coalition Nagkaisa declared, will not lead to the ultimate end but rather to the further strengthening of the legal standing of contractualization in the country. “DOLE intends to adopt what all labor groups unanimously rejected during the labor summit – the ‘win-win solution’ of DTI. This could signal the end of President Duterte’s campaign promise to end endo,” declared Danny Edralin, Vice-Chair for the Private Sector of the Sentro ng Nagkakaisang Manggagawa or SENTRO. For Partido Manggagawa (PM): “The draft new DO may seem to restrict labor contracting to seasonal and project employment but these employment schemes may however be extended to cover jobs, work or services which are directly related to the business operations of a company. As such, contractualization of labor would still proliferate in the guise of describing the job, work or service as seasonal or project employment,” said PM Chair Renato Magtubo. The working draft of the new DO was presented during the Tripartite Executive Committee (TEC) of the Tripartite Industrial Peace Council (TIPC) last week. Said DO recognizes trilateral employment relationship which has long been opposed by organized labor as it undermines workers’ rights to security of tenure, to organize and collectively bargain. For TUCP, the proposed DO is unacceptable. “It is a mere rehash of what current laws already provide. It gives nothing new to workers. 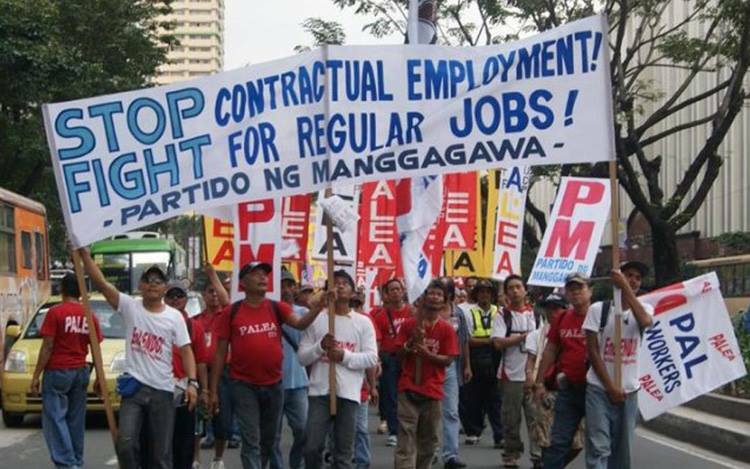 Change requires a DO that further restricts contractualization while a new law is needed to end contractualization,” said Luis Corral, Executive Director of the Trade Union Congress of the Philippines (TUCP). ‘Win-win’, for Nagkaisa, is DTI doublespeak roundly rejected as ‘lose-lose’ by workers. Thus, it is pushing for the passage of HB 4444 (Rep. Raymond Mendoza. TUCP Partylist) which prohibits contractualization and calls on Sec. Bello to endorse it for certification by President Duterte as an urgent Presidential measure. HB 4444 prohibits all fixed term contracts and criminalizes violations. The Bukluran ng Manggagawang Pilipino (BMP) on the other hand wanted to directly challenge President Duterte to completely prohibit endo by means of an executive order. “The new draft DO is a mere attempt to rehash DO 18-A with sophisticated words to continue justifying contractualization under the Duterte regime. Thus, BMP now directly challenges President Duterte to immediately issue an Executive Order to strictly prohibit all forms of contractualization by urgently signing a draft EO which BMP crafted and submitted to the Office of the President last November 10, 2016 for instant Presidential executive action,” said its President Leody De Guzman. Even public sector unions are disappointed on the way the end endo agenda of the Duterte administration regresses. “The proposed DO officialises contractualization and bastardizes Duterte’s campaign platform to end contractualization,” said Annie Geron, President of the Public Services Independent Labor Confederation (PSLINK). The government is being accused by labor groups as the single biggest practitioner of contractualization in the forms of job order (JO) and contracts of service (CS).